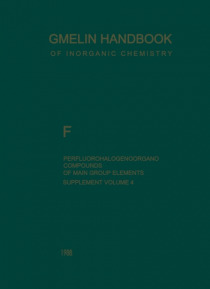 This fourth volume of the Supplement Series supplying the Main Volumes of the series "e;Perfluorohalogenoorgano Compounds of Main Group Elements"e; (Part 1 to 9) covers the heterocyclic compounds of nitrogen as the last main group element of this series. Compounds of the elements of main group 1 to 4, 6 (without 0), and of P, As, Sb, Bi, and I are presented in the Supplement Volumes 1 to 3… . Concept, organization, and selection as to coverage of the material are the same as in the preceeding volumes. Title compounds are either newly synthesized ones or those compounds already referred in the Main Volume Parts 5 and 6 for which new facts have been published. I wish to thank Prof. Dr. Dr. h. c. E. Fluck and his co-workers for their excellent cooperation and many colleagues for providing reprints and patents. One of us (U. Niemann) thanks Philips GmbH Forschungslaboratorium Aachen for generous support. November 1987 Bochum, A. Haas x Table of Contents Page 1 Three-Membered Perfluorohalogenoorgano Nitrogen Heterocycles 1-1 Formation and Preparation . . . . . . . . . . . 1-1.1 Three-Membered Heterocycles with One N Atom.